Cincinnati Bearcats guard Sean Kilpatrick (23) shoots a shot against Central Florida Knights forward Staphon Blair (52) during the first half of the game at Fifth Third Arena. CINCINNATI (AP) — Staphon Blair went up for a dunk, ready to slam the ball down with both hands. Justin Jackson wasn’t going to let that happen. "I was like, `Really?’" Jackson said. "They’re going to do that? I blocked it." The forward slid in from the side and swatted the ball out of Blair’s firm grip. He headed down the court and thrust out his lower lip as the student section started chanting his name. Cincinnati’s shot-blocking, ball-swiping defense had yet another big moment Thursday night. Jackson matched his career high by blocking seven shots and Sean Kilpatrick scored 19 points with a strong second half that carried No. 15 Cincinnati to its 11th straight win, 69-51 over Central Florida. And it’s been mostly a matter of defense. The Bearcats have held their last 27 opponents under 70 points, the longest active streak in Division I. "We take a lot of pride in it," Kilpatrick said. The Bearcats took control by opening the second half with an 18-5 run set up by six turnovers, sending Central Florida (9-8, 1-5) on course for its fourth straight loss. "I thought we played tough defensively and thought we did a good job of getting to the line, but we couldn’t make free throws," coach Donnie Jones said. "If you are not making them, you aren’t getting anything out of it, so you resort to jump shots." Calvin Newell scored 12 points for the Knights, who were only 5 of 16 from the free throw line, had 14 turnovers and shot just 36 percent from the field in the second half. "Again our defense — tremendous," Cincinnati coach Mick Cronin said. Jackson steadied Cincinnati through a ragged first half, most of which Kilpatrick watched from the bench with two fouls. Jackson finished with 12 points and four steals. Kilpatrick leads the AAC at 18.6 points per game, but was limited to five points in only 9 minutes during the opening half because of fouls. Jackson took over at both ends of the court, helping the Bearcats hold an early lead through most of the half. 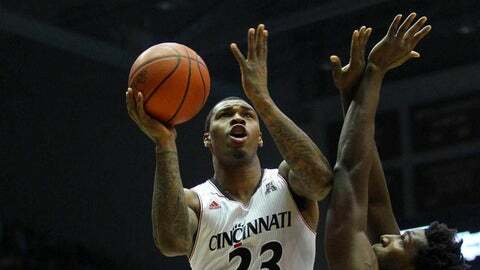 Jackson had a team-high eight points, blocked five shots and had four steals as Cincinnati led 30-27 at halftime. The 6-foot-8 forward got the Bearcats revved up by blocking a shot, making a steal and blocking another shot on three straight UCF possessions. At halftime, he was on pace for a double-double and maybe even a triple-double. "I think about that every time I step on the court," Jackson said. "I try to get a quadruple-double. I try to do everything." The Knights went 5:29 without scoring in the first half and missed 13 of 16 shots during one span, helping Cincinnati pull ahead by as many as eight points. The Knights put together their first run of the game to close the half. Newell had a steal and layup and a driving bank shot during a 9-3 spurt that cut it to 30-27. Kilpatrick opened the second half with a 3-pointer from the left corner, starting the run that left the Bearcats in control. Kilpatrick also had a pair of free throws and a layup during the 18-5 surge, which featured six turnovers by Central Florida. The Bearcats made eight of their first 11 shots in the half while pulling ahead 53-35. Jackson also had his emphatic block that got the student section chanting his name. "I heard them, but that’s not my focus then and there," he said. "It was great, actually. When you look back on it, it’s an honor to get your name chanted. You don’t get that every day." Kilpatrick’s 3-pointer from the left corner made it 58-38 midway through the second half. Central Florida never got closer than 13 points the rest of the way. Cronin wasn’t happy with the way the Bearcats coasted in the final minutes after opening that big lead. "We got up 18 at the 9-minute mark and we were ready to go get some pizza, where I want them to get up by 40," Cronin said. "It’s just a mentality. You’ve got to guard against complacency when you’re winning."